Active School Flag - Scoil Muire na Dea Chomhairle Kilkishen N.S. Super Troopers is Ireland's first 'health homework' campaign aimed at helping parents and children achieve the recommended 60 minutes of physical activity a day. Over 60,000 Irish children aged 4-12 participating in the 30-week programme get an easy-to-follow physical activity ‘homework’ planner with a plan to follow every day. Each daily plan is based on short-burst activities that marry physical exercise with fun games such as musical bumps, penguin shuffles, freeze tag and wall ball. It looks like fun!Super Troopers is Ireland's first 'health homework' campaign aimed at helping parents and children achieve the recommended 60 minutes of physical activity a day. Over 60,000 Irish children aged 4-12 participating in the 30-week programme get an easy-to-follow physical activity ‘homework’ planner with a plan to follow every day. Each daily plan is based on short-burst activities that marry physical exercise with fun games such as musical bumps, penguin shuffles, freeze tag and wall ball. It looks like fun! ​Top ten tips for parents to get children active. Get a routine going for physical activity every day. Make physical activity family time. Teach your child games you played when you were young. Let your child earn pocket money by doing active chores. Encourage your child to take up an after school activity. Help your child by teaching them the basic skills: catching, throwing. Give the gift of activity i.e. buy gifts that encourage activity e.g. ball, skipping rope, hula hoop etc. 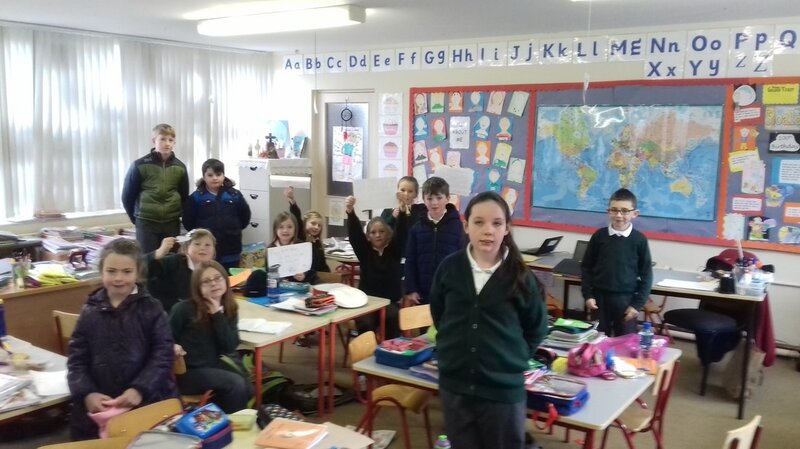 After a long selection process the children of the active school committee have decided on an active school motto for Kilkishen National School. 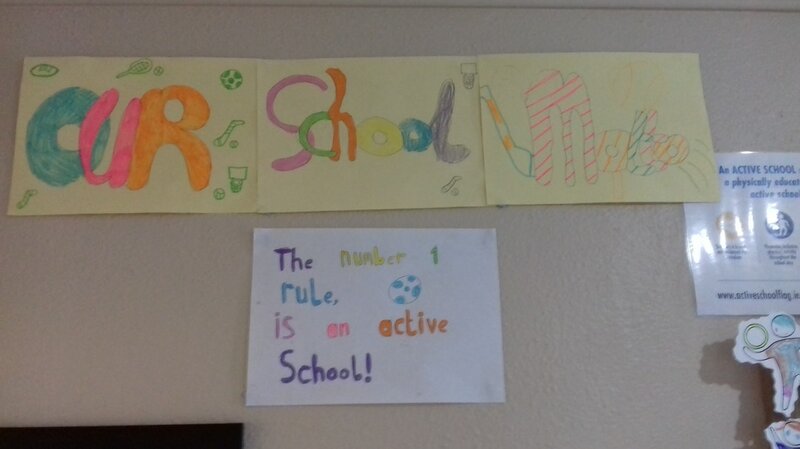 The winning motto is very catchy ''THE NUMBER ONE RULE IS AN ACTIVE SCHOOL'' The committee would like to thank the students from junior infants to sixth class who participated in the process. The school lunchtime soccer league has turned into a huge success. The children love the idea of playing for their favorite team. Huge credit is due to the boys and girls of the active school committee for setting up the league and officiating the matches. They also kept record of each goal scored and as you can see Manchester City are currently on top of the league. The students of Kilkishen N.S. start their day with activity to get their brains ready for learning. Every morning before the bell rings at 9.20 four students lead the rest of the school in doing different activities from their supertrooper journal. It has proved to be an enjoyable way for the children to get ready for a day of learning and fun. 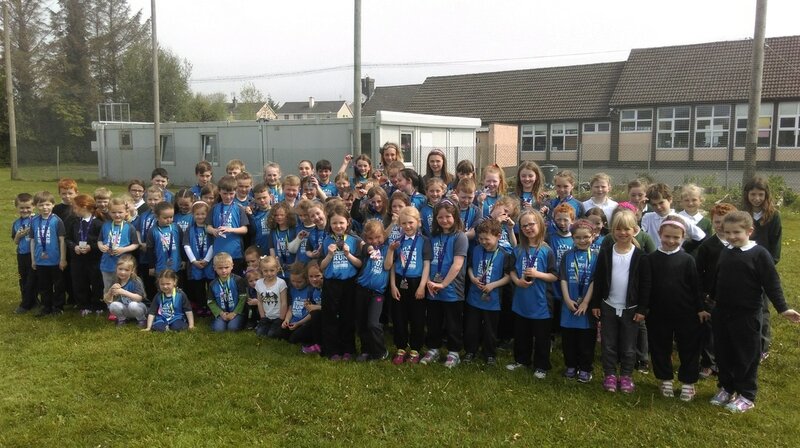 The students of Kilkishen N.S. had a very active day today. It started off with the very popular operation transformation initiative 10@10. 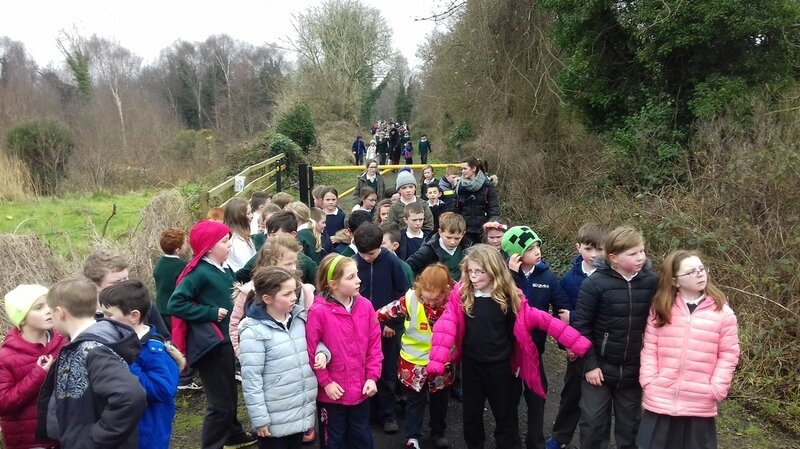 In the afternoon the whole school embarked on the 5km local bog walk this has proved to be very popular with the children over the past few months. The children love to be active and get excited with each initiative that the school and active school committee embarks on. Everyday the children partake in the supertrooper programme which promotes exercise as part of their homework. 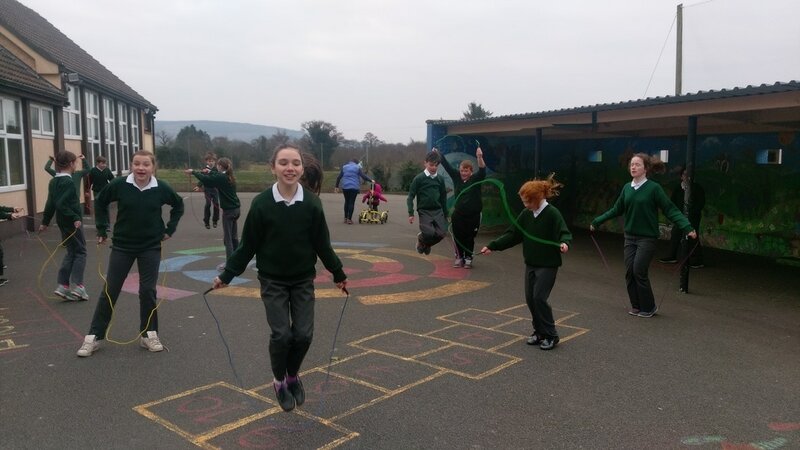 Without a doubt the students in Kilkishen are some of the most active students in Ireland!!!!!!!!! The active school committee would like to share a new healthy recipe for everyone to enjoy. Remember that an active body leads to an active mind. Enjoy!!!!!!!! The Ingredients 1/2 cup milk of choice (I used almond milk) 1 cup Greek Yogurt 1 cup frozen strawberries 1/2 medium orange, peeled 1/2 teaspoon vanilla extract A little honey, maple syrup, or stevia to sweeten (optional) The Add-ons 1 tablespoon coconut flakes or shreds 1/2 cup berries of choice 1 cup baby spinach, kale. Pupils in all classes took part in the RTÉ Operation Transformation challenge this morning at 10 am. The initiative called "10 @ 10" invited classrooms around the country to get physically active for ten minutes at 10 am today. The event was a great success an all pupils completed a five station, two minute per styation, circut of skipping ropes, speed, agility and quickness drills, basketball, parachute games and "Stretch and Grow" exercises. Thank you to Ms. MacLean for coordinating the event. Pupils will continue the"10 @ 10" challenge over the next few weeks. The U11 basketball team played their first match against Cree yesterday. They enjoyed themselves and played extremely well but were unfortunately beaten. Well done to all who took part and a big thank you to their coach Martina O'Hagan. The Active Flag Committee have met this week and are proposing ways for pupils to be as active as possible during lunchtime. The committee are working to teach younger classes fun games from the SuperTroopers programme. The committee is promoting participation in the school soccer and basketball leagues and creating fun obstacle courses for the middle classes. Healthy eating is also a priority for the committee and they will be publishing delicious recipes to try out on the website. Keep active and stay healthy everyone. With the holidays coming up this weeks healthy recipe has a festive feel to it. Enjoy!!!! 1 tablespoon lemon juice½ teaspoon salt. Freshly ground pepper, to taste. Preheat oven to 400°F. Arrange sweet potatoes in an even layer in a 9-by-13-inch glass baking dish. Combine maple syrup, butter, lemon juice, salt and pepper in small bowl. Pour the mixture over the sweet potatoes; toss to coat. Cover and bake the sweet potatoes for 15 minutes. Uncover, stir and cook, stirring every 15 minutes, until tender and starting to brown, 45 to 50 minutes more. 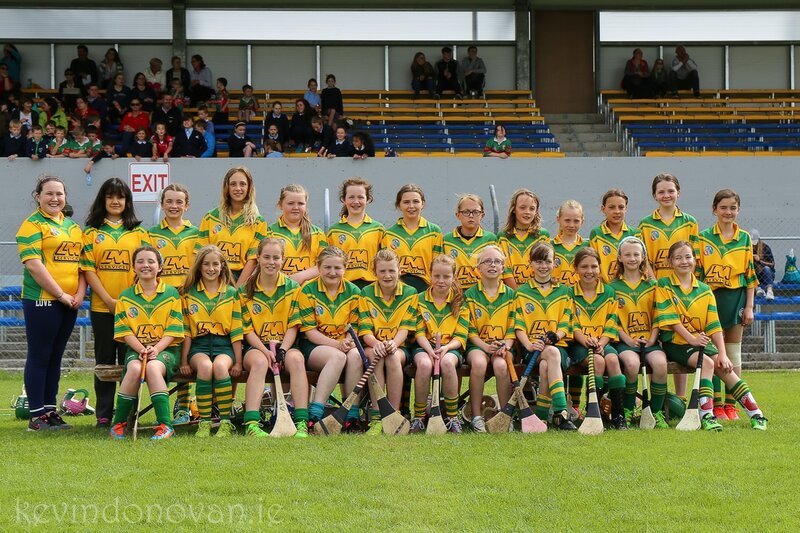 Kilkishen girls were crowned U/13 champions after a hard fought victory over ClooneyQuin last week. Current and past pupils from Kilkishen N.S. were represented on the team. Captain Roisín McNamara and past pupil Chloe Philpott visited the school with the shield on Thursday last. Congratulations to all the girls involved. The boys and girls in 3rd and 4th Class had a wonderful day at the Gaelic Football Blitz yesterday. 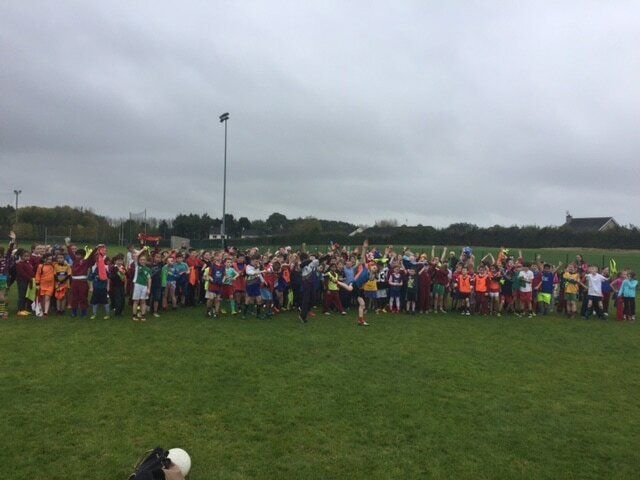 It took place in Wolfe Tones na Sionna GAA grounds and over 200 children were present. It was wonderfully organised by Peter Casey and everything went off like clockwork. 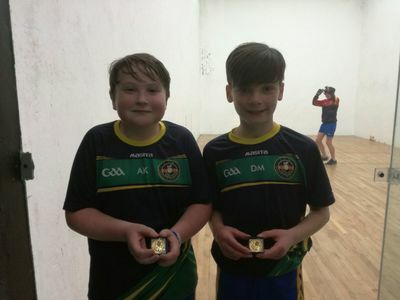 The emphasis was on children enjoying themselves and taking part regardless of whether they played Gaelic football for a club or had never played it before. We would like to sincerely thank Peter for organising this fantastic event and we look forward to the next one. Kilkishen N.S. pupils have been awarded Clare Community Games All-Star awards for their project entries this year. Clara Madden and Eadaoin Moroney will receive their awards at a special gala dinner ceremony at the end of October. Everyone in Kilkishen N.S. is very proud of their achievements and wishes them well on the night. 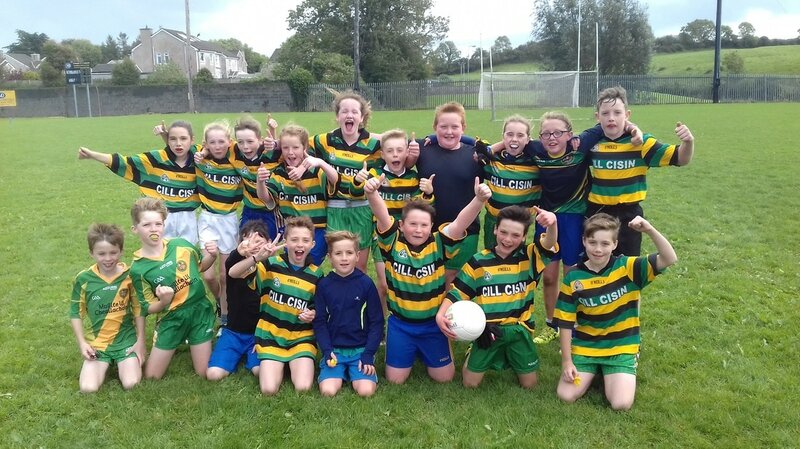 The boys and girls from Kilkishen competed in a Gaelic Football blitz held in Newmarket. The other teams involved were Broadford, Parteen and the hosts Newmarket. The team competed and displayed some unbelievable passages of play that would not be out of place in Croke Park on Saturday. Despite not winning our team can be proud of their heart and style of play. Mickey Canny in 6th class was a scoring machine and his individual skill was a joy to watch. Darragh Moroney covered every blade of grass in Newmarket pitch and was a stellar performer throughout. This group of players should be so proud of themselves their drive and never say die attitude was an inspiration to watch. Training for Gaelic Football will continue during lunch time next week. From today's performance the future of the big ball is bright in Kilkishen. 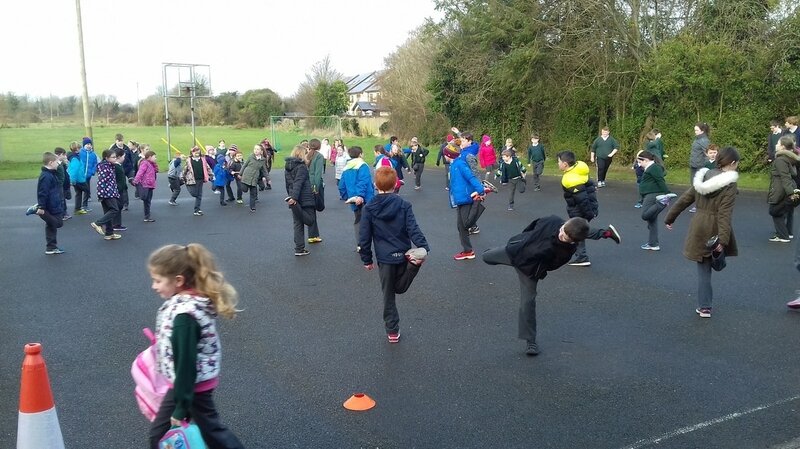 Hurling and camogie coaching commenced in Kilkishen N.S. for all pupils on Thursday and will continue every Thursday until Halloween. John Condon G.A.A. coach is providing coaching sessions with all children from infants to 6th. Pupils are working on passing, receiving, movement and striking skills. The focus on these sessions is the development of skills and enjoyment. Great participation levels were observed today and pupils really enjoyed the sessions. Thank you to O'Callaghan's Mills G.A.A. Club and and Ger Moroney for coordinating the coaching. Thank you to John Condon also for his time coming to Kilkishen. On Wednesday 33 pupils from Kilkishen N.S. took part in the Clare Schools Cross Country Athletics event held at Lee's Road in Ennis. In terrible conditions, Kilkishen N.S. had some superb performances and returned with a number of medals. In each race the top 12 finishers received medals and qualify for the County Cross Country Finals to be held this term. Seán Boyce finished in 4th place in the U/10 Boys race and his team mates Callum Casey, Martin Bon, Seán Ryan, Kyle Tuohy and Zak McInerney all performed very well. In the Girls O/10 race Chelsea Canny finished in 4th place also with Julie Murphy finishing 11th and Abby Heffernan in 20th position. The team won Bronze medals and will compete again at the County event. The highlight of the event came in the final race of the day, the Boys O/10 race. Darragh Moroney put in a superb performance to cross the finish line just ahead of the runner-up and win Gold for Kilkishen. 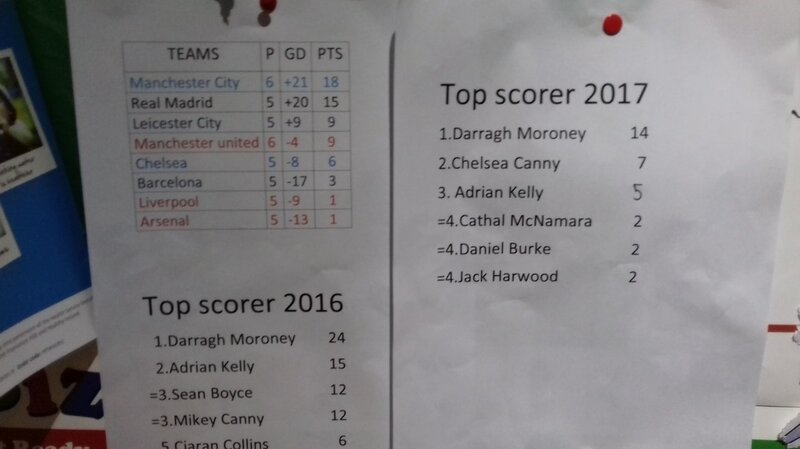 Darragh heads to the County Finals with great confidence after this superb performance. Thank you to Martina O'Hagan, Richard Greaves, Edel McInerney and all parents that helped out on the day. Despite the weather it was a great day for the pupils involved. 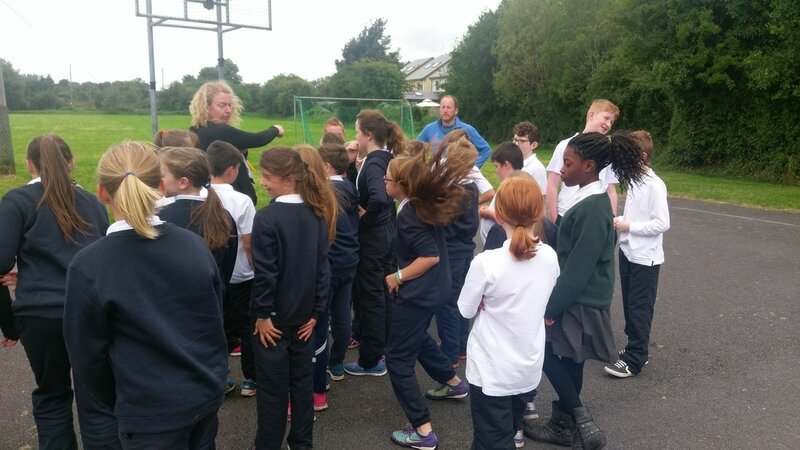 Pupils from Infants to 6th are participating in athletics coaching sessions with Martina O'Hagan and Richard Greaves every Thursday. The sessions are focusing on pupils agility, footwork, speed, running technique and stamina. 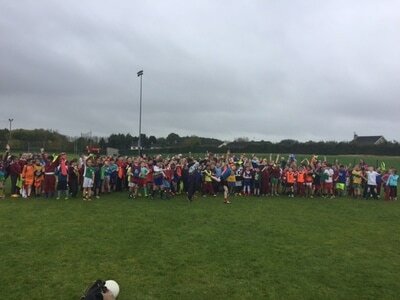 Pupils will get an opportunity to try out for the school's cross country running U/8, U/10 and O/10 teams that will participate at the Clare Schools competitions in Lee's Road on Wednesday September 21. Here's some photos of the pupils in action today. 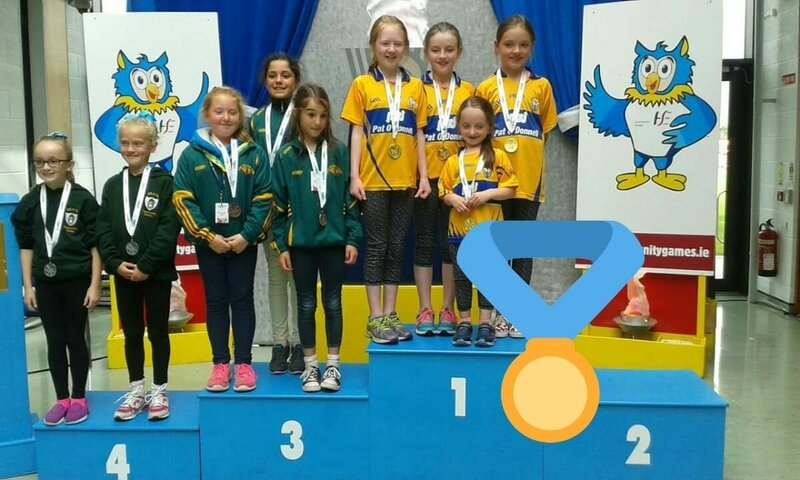 Well done Kilkishen U/11 Project competition winners at the National Community Games finals. Representing Kilkishen and Clare were Eadaoin Moroney, Keelin Moroney, Myra Donnellan, and Aoife Frost. Everyone at Kilkishen N.S. is thrilled and extremely proud of your achievements. 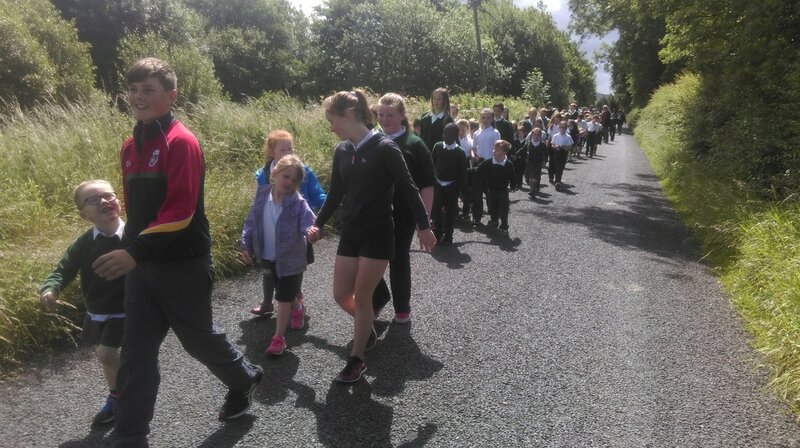 Pupils from all classes took part in the Kilkishen Castle Bog Walk as part of our activities for Active Schools Week. The walk includes a 1 km section that introduces walkers to unique bog habitats and species. The walk began from school, continued to through the bog walk and through the village back to school. It was a very enjoyable activity promoting an appreciation and knowledge of the locality. ​City side. The soccer league coincides with the schools active week. There will be lots of different events throughout the week including a Bog Walk and a sports day. Victorious Kilkishen N.S. Camoige Team. The schools soccer league continued throughout the week. Chelsea defeated Manchester United on a scoreline of 4-0 with the aptly named Chelsea Canny scoring three and Sean Murnane adding another. Arsenal took on Liverpool with the gunners coming out on top on a scoreline of 3-0 with Darragh Moroney scoring two and Hollie Nugent scoring another. The league was run in conjunction with the school's active week, however due to the excitement generated by the league, we will continue again next week.